Installation of the hydraulic hot-stamping press was no small task. At 13 m high and 5.5-m wide, the 1500-metric-ton customized offering required raising the building’s roof by 20 ft. Newly formed Telos Global is making a name for itself with the world’s largest hot-stamping production line at its $35-million, 200,000-sq.-ft. plant, located on 13.5 acres in Caryville, TN. A subsidiary of Germany-based Eisenmann, provider of thermal-process technology, Telos focuses on testing, production and training associated with hot-formed (aka press-hardened) steels used in structural automotive parts such as B-pillars, rocker panels and door rings. With more than a quarter of a vehicle’s body shell consisting of hot-formed steels, the need for production equipment and training shows no signs of letting up. That’s where Telos comes in, says Rick Teague, CEO of the automotive and Tier One/Two supplier. Launched in January 2016, Telos moved quickly to make changes to the building it acquired in March 2016 to accommodate the line, which became fully operational in September 2017. The building previously housed the roll mills and fabrication equipment for manufacturing industrial metal siding and roofing. The $10-million hot-stamping line, at 65 m long and 39 m wide (from the end of the destacker to the die cart) is the world’s largest, Teague says. 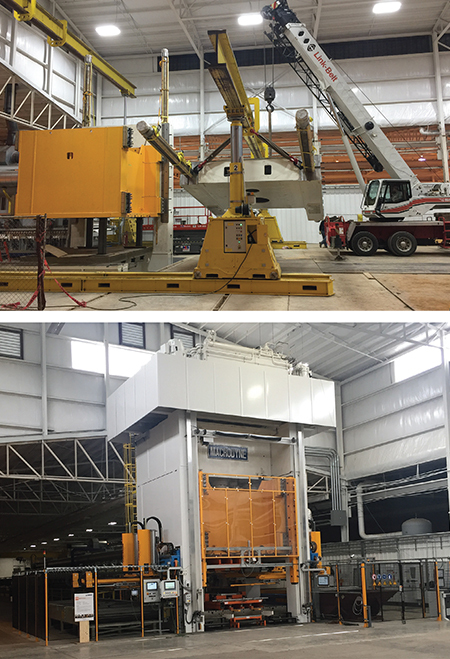 A $10-million project, the line includes a 43-m-long Eisenmann roller hearth furnace and a Macrodyne 1500-metric-ton (15,000-kN capacity per Macrodyne specifications) hydraulic hot-stamping press, which required that the building’s roof be raised 20 ft. in the center press bay area and a press pit installed. The second purpose: production parts. “To achieve a return on investment, we’re running pre-production, series production and prototype structural parts for automotive customers,” says Teague. “Our state-of-the-art line manufactures customized press-hardened parts that our engineers—nearly half of Telos’ 40-person workforce—develop in close collaboration with our customers. Our inhouse toolmaking shop supplies the tooling required—from prototypes through to the serial products. 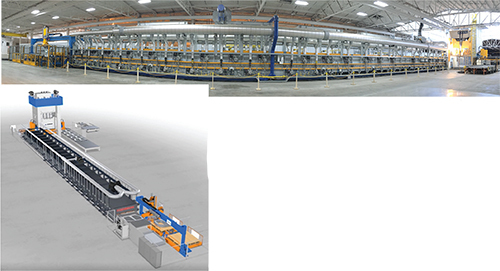 The world’s largest hot-stamping production line, according to Telos Global officials, is 65 m long and includes (bottom photo) this 43-m.-long Eisenmann roller hearth furnace. Equipping the line to fulfill its three purposes called for a large, customized press. Having worked with Macrodyne in the past while with Cosma International as global director of hot stamping and tooling development, Teague teamed with the Concord, Ontario, Canada-based press builder to develop a custom machine for the line. Max. pressing speed (to 2500 kN) using one cylinder: 300 mm/sec. Max. pressing speed (to 7000 kN) using three cylinders: 110 mm/sec. Max. pressing speed (to 15,000 kN) using four cylinders: 50 mm/sec. Teague says the size of the line is important for processing larger parts, such as door rings measuring 1.8 m wide and 1.52 m tall. “To accommodate larger products,” he explains, “you need mass capacity in order for the furnace to take on the energy consumption required for larger product. See also: Macrodyne Technologies, Inc.